Wretton is a parish in the West Norfolk Local Government District, and has an area of almost 470 hectares. It is situated some 9km to the east of Downham Market, and is bisected by the Cut-off Channel of the River Great Ouse. The name ‘Wretton’ is thought to derive from the Old English words for enclosure where crosswort is grown. The earliest objects recorded in the parish are a Neolithic stone axehammer (NHER 2519), two polished axeheads (NHER 2517 and 2518), as well as a Neolithic to Bronze Age polished implement (NHER 2520) and a Neolithic or Bronze Age stone axe and spearheads (NHER 2521). No Neolithic monuments are recorded, but the cropmarks of undated ring ditches of possible Bronze Age date (NHER 18243) have been recorded. Also from this period are a Bronze Age copper alloy flanged palstave (NHER 2522), two axeheads (NHER 2639 and 21750) and a spearhead (NHER 4419). A small number of objects from the Iron Age have also been discovered, and these comprise pottery sherds and a brooch (NHER 31799), and a coin and brooch (NHER 39364). Objects from the Roman period have also been recorded, and these include coins (NHER 31799 and 40008), pottery sherds (NHER 34579 and 45443) as well as personal objects such as brooches and pins (NHER 37439 and 39364). In addition to these a possible Roman settlement and corn drier have been recorded (NHER 13457). In 1956 a small domed structure was uncovered and identified as a corn dryer, and at the same site a large number of Roman pottery sherds were recovered. In addition a number of millstones were also found, and the cropmarks of a rectangular enclosure with internal features has also been noted. No Saxon period monuments have been recorded, but a number of objects have been found. These include objects such as an Early Saxon pyramid-shaped sword belt mount (NHER 39364), pottery sherds (NHER 35083), as well as a Middle to Late Saxon strap end and Late Saxon bridle bit (NHER 39364), a 7th century disc brooch (NHER 40008) and Late Saxon pottery sherds (NHER 35084 and 37263). 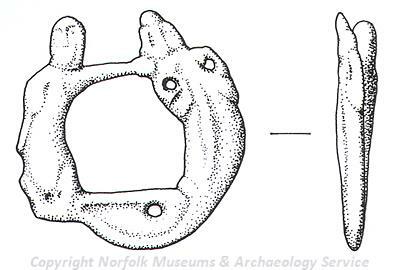 A possible Early or Late Saxon or medieval burial, containing a shield boss, spearhead, small single edges sword and knife was also noted in 1912 (NHER 4416). No mention of the parish is made in the Domesday Book of 1086 however All Saints’ Church (NHER 2560), the earliest building in the parish, contains a Norman doorway, indicating that the settlement had reached a notable size early in the medieval period. The small church has a carrstone chancel dating to the 14th century, with an aisle and tower of around 1300 and a porch of 1500. Inside are a good 14th century rood screen, as well as benches dating to 1627. No other medieval monuments are recorded, but a number of objects have been recovered. These include coins (NHER 37263 and 40008), pottery sherds (NHER 34579 and 35083), as well as personal objects such as buckles (NHER 31799), brooches (NHER 39364) and a finger ring (NHER 37439). Other objects of note include a medieval pilgrim or secular badge (NHER 37547), a seal matrix (NHER 39879) and a rowel spur (NHER 45443). Similar post medieval objects have also been found. During the late 19th and early 20th century Wretton was also crossed by the Downham to Stoke Ferry Railway Line (NHER 13598), which ran from the Denver Junction of the main King’s Lynn to Ely Line to Stoke Ferry just to the east of Wretton. The line opened on 1st August 1882, and closed to passengers on 22 September 1930, with freight use continuing for many years until around 1982. The line was predominantly used for the transport of sugar beet, and Abbey station connected with the Wissington Light Railways, which was a network of agricultural lines opened in 1905 and partly worked for the Ministry of Agriculture until closure in 1957.